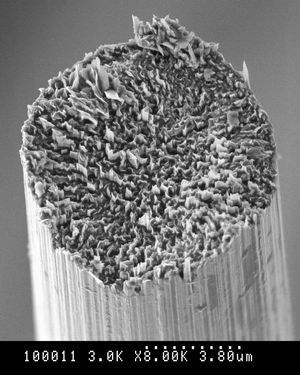 HOME > Material > What is Carbon Fibers? A Carbon Fiber is a fibrous carbon material having a micro graphite crystal structure made by fibrillation of Acrylic resin, a well known textile material, or from oil/coal pitch and then by being given a certain heat treatment. 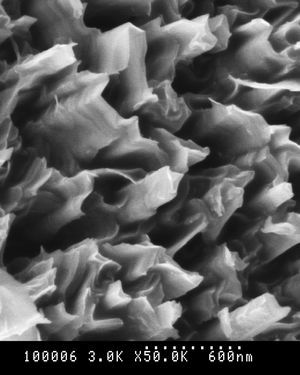 Carbon fibers, under industrial production now, are classified into PAN-based, pitch-based and rayon-based. Among them, PAN-based carbon fiber is in the largest production and best used in volume. In the beginning of 1970’s, commercial production of PAN-based and isotropic pitch-based carbon fibers was started on a large scale in Japan. In the latter half of 1980’s, anisotropic pitch-based carbon fiber manufacturers broke into the market. As the fruit of tireless technological improvement and business expansion, Japanese carbon fiber manufacturers have been keeping their position as world number one at quality and production volume of carbon fibers. Usage of carbon fiber by itself is not the rule. Commonly, customers apply carbon fibers for reinforcement and / or functionality of composite materials, made with resin, ceramic or metal as matrix. 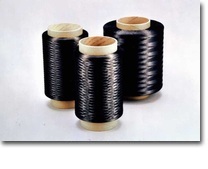 Carbon fibers are extensively applied to a large variety of applications with supreme mechanical characteristics (specific tensile strength, specific modulus) and other characteristics due to carbon matter (low density, low coefficient of thermal expansion, heat resistance, chemical stability, self-lubricity, etc.). Now used in wide variety of field!